"Thundermachine to New York City. The hostage situation is under control. I couldn't have done it without your support. Stay great, and tell someone you love 'em today." That marked seven-hundred and twenty days in a row that Carter Jove had sent out such a message to punctuate some fantastic feat completed in the legendary red-and-gold armor. Today it had been a particularly harrowing crisis in a local high-rise involving two captives and what seemed to be some sort of political radical threatening to blow the entire building to Hell. Whoever they were, they hadn't counted on Thundermachine himself bursting up through the floor and instantly disabling the remote detonator with a VR-assisted glance. When the rebel turned a handgun on his victims, all it'd taken was a metal-jacketed jab to the forehead to put an end to the threat. The revolutionary was in police custody with a major concussion, and Jove had taken to social media to report the mission's success. The moment it had hit the news cycle, he knew it had to be handled promptly. That was what he was best at: keeping the Big Apple safe. His team at X-Tech reported a continuation in declining crime rates, even though he never really targeted street-level muggers - not when the average excursion cost around $20,000 overall. All things considered, the Machine was extremely cost-effective given its capabilities; most fighter jets couldn't land in a person's apartment and knock out a terrorist with a fist, saving money on ammunition in the process. Plus, no lost lives. It was the perception that he would stop muggings that prevented them from happening. Jove considered himself one of the United States' greatest "living deterrents," as he'd come to think of his super-powered compatriots. Sentient bioweapons; nukes with social security numbers; super-soldiers; whatever you called them, the impact of Biotic Agents, both government-sanctioned and private, had changed the game. They were living in the Super Century now. "Hermes, take me along a standard flyby route. Give the people a barrel roll or two, he spoke over the comm, the message received back at X-Tech. "Roger that, Mr. Jove," came the standard response, but Carter could detect the smile on the other end. Hermes Bell was his top aide and chief engineer of the original Project Thundermachine design team. Bell knew the armor better than anyone, and nobody was more suited to pilot it by remote. Shifting into drone-configuration, Carter let his muscles relax as his best friend took over from behind a computer console. Spinning dramatically around a skyscraper, he felt his hand raise gently to wave at the civilians below, moved like a puppet by the techs back at the lab. That was fine; he was browsing a dating app instead, the HUD in his helm flashing up profiles as his armored body executed an Immelmann Turn around the Empire State building. The courts had ruled that the Thundermachine device was not in fact a vehicle, and though there had been threats of overturning that ruling in the past, it meant that he was free to soar between skyscrapers to his heart's content. Of course, it was all calculated for maximum exposure, but still...it was fun. "Any word from our boy in DC?" he asked idly, using his eyes to swipe left, left, left, right. "The Odin situation seems to have quieted down again. There haven't been any...protests...for the past few days," Hermes said nervously, biting his lip. The self-appointed "Protector of the People" had been drawing more and more scrutiny lately, and it seemed that most citizens were demanding a "team-up" of sorts between Jove and the masked man that often floated around the Washington Monument. Whatever deal had been struck between Homeland Security and Odin seemed to put the populace at ease, but Carter and his team at X-Tech were much less trusting of the white-clad sentinel. For starters, he was an instigator, known for his extended critiques of the status quo. The bully pulpit had become the superhero pulpit, and he was known for using it to piss people off, unlike Thunder. Secondly, his technology was unlike anything they'd ever seen - maybe even biotic. 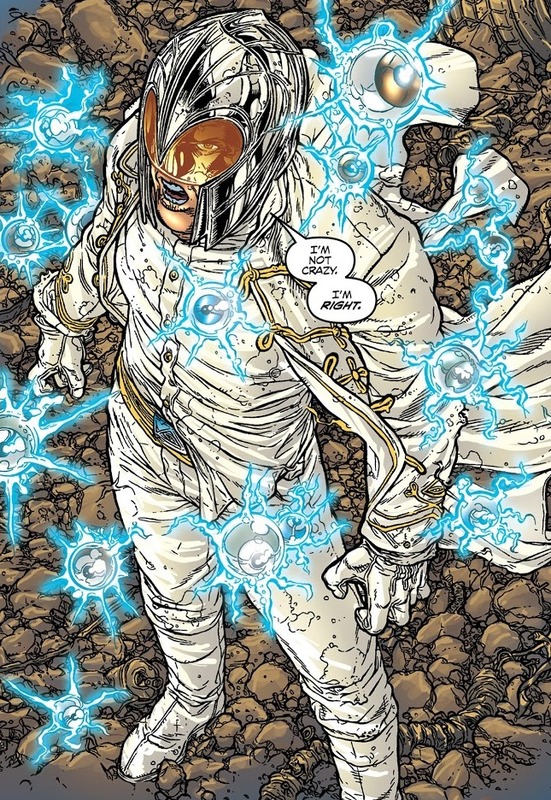 Hermes had continually floated the notion that he was a Gene-Weapon, a modified man with superpowers. That struck Carter as likely, but he'd never gotten close enough to scan Odin. He had half a feeling that one of those floating eyeballs would knock him out of the sky the moment he entered Washington airspace. Normally a no-fly zone, but not to supers. Privileges of power. ONE NEW MATCH! his HUD flared, accompanied by a tiny heart. Using the suit's tech to isolate her location (evil when the government does it, sweet when it's Carter Jove), he felt a wry smile tug at his lips. Chrysler building - he could work with that. "That's good, man. Tell the rest of the crew they did a great job today. I'm taking X-Tech out to Dorsia to celebrate," he said with a smile, dismissing the dating app with three rapid blinks. He could hear a few cheers in the background from the scientists. "Hermes, I'm switching back to manual. Going to say hello to tonight's date before bringing Thundermachine back to the hangar." Soaring by her window, he gave a rapid wave, confirming that the profile hadn't been a fake. All of the uncertainty of what philosophers had dubbed the Super Century faded in that one moment, when her blue eyes met his glowing lenses. No more super-industrial complex, ultrahuman coups, or World War III to be concerned with; no more Odin and his watchful eyes hovering over Washington. Just him and the girl. He closed the comm. "End of the Western World? Please," he scoffed, looping away to land the armor back at X-Tech. "I'm Thundermachine. Bring it on." A CS thread will be up soon, but feel free to brainstorm in here! I can be reached in the RPF Discord if you have any personal questions or just want to chat. Let's kick off the Super Century with a bang. Last edited by Thundermachine on Sun Apr 15, 2018 9:52 pm, edited 2 times in total. CS thread is up here!